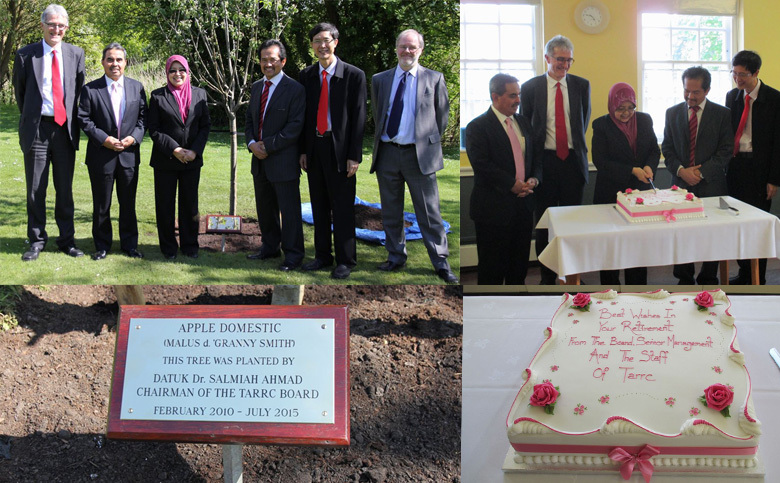 TARRC said thank you and goodbye to its Chairman, Datuk Dr Salmiah Ahmad during her visit to Brickendonbury on May 22nd 2015. Her official retirement will be 23rd July 2015 after almost five and a half years in office. Datuk Salmiah has steered TARRC through some challenging times during the difficult global economic environment and her support and dedication have allowed TARRC to continue to expand its R&D and promotional activities that provide such a vital contribution to the success of the rubber manufacturing industry in Malaysia. In recognition of her services to TARRC, Datuk Salmiah was presented with a gift and a commemorative tree was planted in the grounds of Brickendonbury.